FUF – Y’all Ask the Best Questions! Have you entered the giveaway for the dog book, A Dog Named Boo? DO IT NOW!! I never noticed Jimmy’s tuft before. If it gets out of control what happens? Need he go to the groomers? 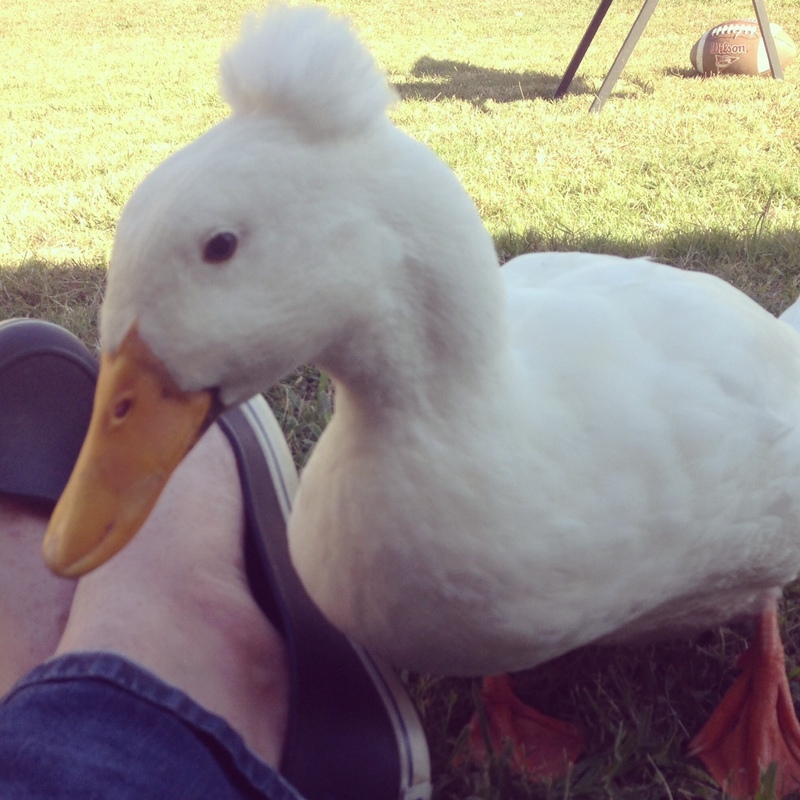 Is there such a thing as a duck groomer or would you have to do it yourself? Drakes (male ducks) make good pets. They’re a little neurotic, but quite affectionate. When are you going to color the mohawk??? I’ve been looking for sidewalk chalk to do just that. It’s a bad time of year to find it. I also want to make a crown for him. Jimmy the duck has FaceCrack followers who refer to him as King James. For now we’ll make do with the pirate hat. I think I know, now, why he bites me. Does your daddy hire out cos we have lots of projects around our house that we could use his help with. Hunny says that he can’t go to Iowa to build things. He also said that he’s a chicken pimp and needs to stay close to home to keep an eye on his girls. Something about other people taking the eggs. Whatev. I think that’s a no, Stella Rose. Sorry. Crow for a pet? Do want. In fact, I was talking about this to hubs a while back… I mean, wondering if you could convince crows to stick around around and be pets? Not caged, of course. So. I don’t really have an answer for this. Just a story. Would you like a story? Gershwin and I talked to each other all the time. When he really learned to fly, it made me nervous. I’d take him outside for a walk and he’d fly a short bit away. Once he flew into a tree and I walked to the power company and asked them to bring their cherry picker to come get him down. They did. I love small towns. After that I kept a ten foot length of fishing line tied to Gershwin’s leg when I’d take him outside, with a fishing weight tied to the other end, so he could only fly so far before fluttering down. I was teaching him to eat from a bird feeder in the back yard so I could set him free. The day before I was going to set him free, Gershwin fell in the toilet and drowned. I’m sorry. That wasn’t a happy story. I guess my point is, I was almost there. Gershwin probably would have made a good outdoor pet. I think he would have come back every day. Sorry to end on such a down note. Hm. No idea how that happened. On a much happier note, as you read this I am probably driving my little Prius to Louisiana to visit with a brand new life, my new niece little Darina. She’s beautiful and I can’t wait to meet her. I hope you all have a great weekend.